I’ve been working on this new quilt for the past ten days. 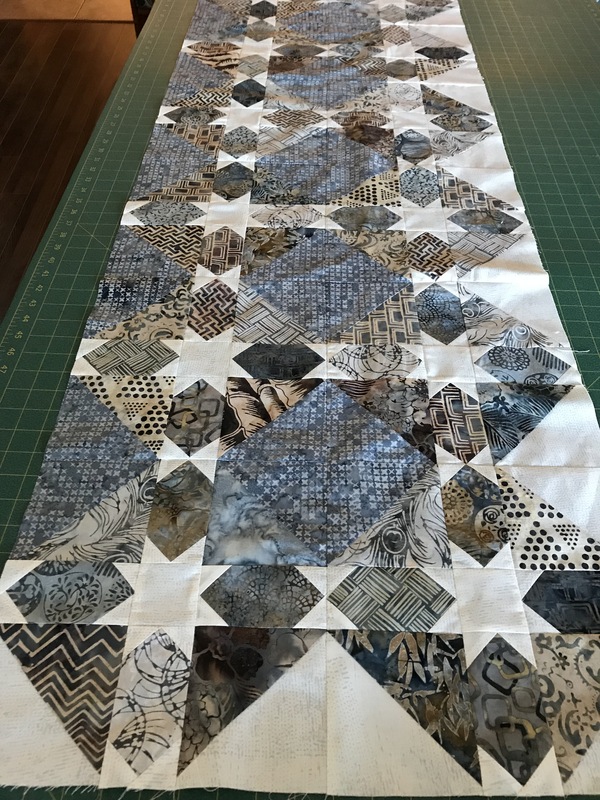 I started with sixteen grey batik 10″ squares and eighteen assorted beige/blue/grey 10″ squares – in effect a “layer cake.” I’d had the fabric in my stash for over a year not sure what to make with it. 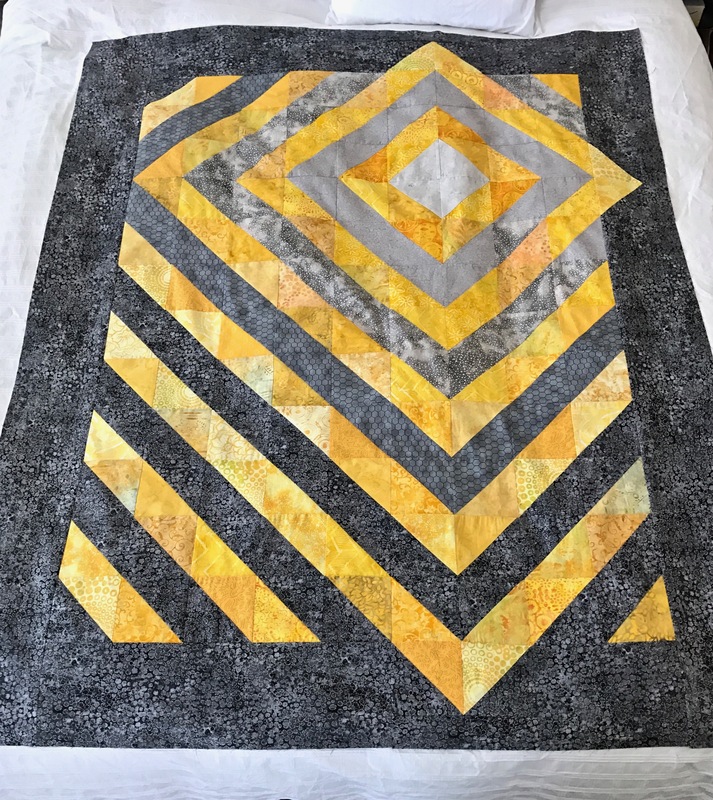 I didn’t have enough of the grey squares to do a whole quilt top so I added some Zen Chic (Fragile, Chalk Stamped) yardage which I also had in my collection. 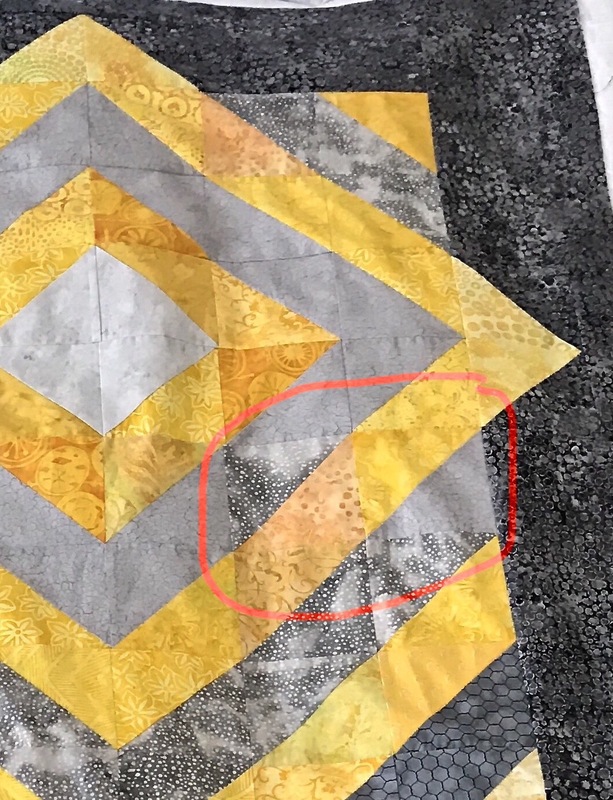 I decided to do an outer “border” with the white, doing the centre of the quilt using the grey batik. 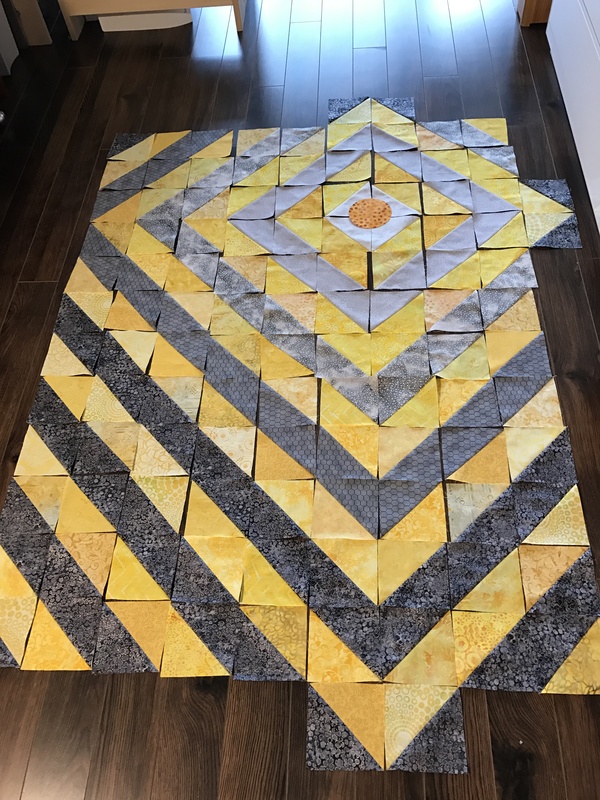 I cut each 10″ square in four and constructed a total of 96 half square triangles, making sure I had enough blocks using the white to build the perimeter of the quilt top. Next I carefully laid out my HST and began sewing them together. 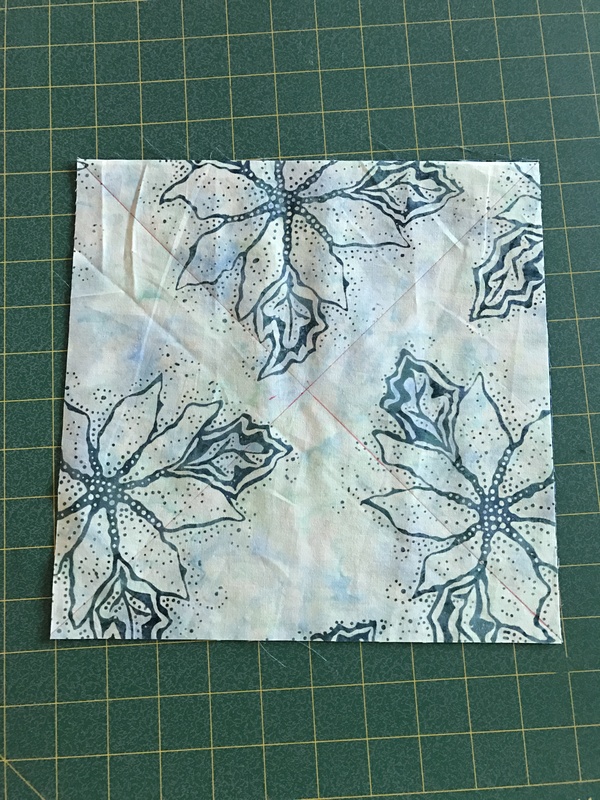 Each block has four HSTs separated with a sashing constructed from 4 1/2″ rectangle “snowball” blocks – turns out I had a jelly roll using many of the same fabrics as the mixed batik 10″ squares I began with. I pulled out 12 strips to use for the sashing. To complete the snowballs I needed 384 one and a half inch white squares to add to the four corners of each rectangle. So far, I’ve assembled half of the inner panel of the quilt top – you can now see the white perimeter taking form and the grey batik interior squares are emerging. I have two more columns of blocks to construct to add to this half panel. Then I will border the panel with more of the white patterned fabric. I have enough backing fabric that I should be able to add a narrow border of that fabric as well. In the meantime it’s back to the snowballs – I have 48 more to construct. Once the snowballs are done the remainder of the top construction will go quickly. I needed to piece an eleven inch strip to insert into the single width of backing fabric I had (that’s the primary reason I piece the back of my quilts – to get the width I need for the quilts). I had lots of small amounts of the Asian print fabrics I’d used for the top so I cut single 2 1/2″ strips, sewed them together in pairs on both edges, cut triangles which resulted in 2 1/2″ squares. 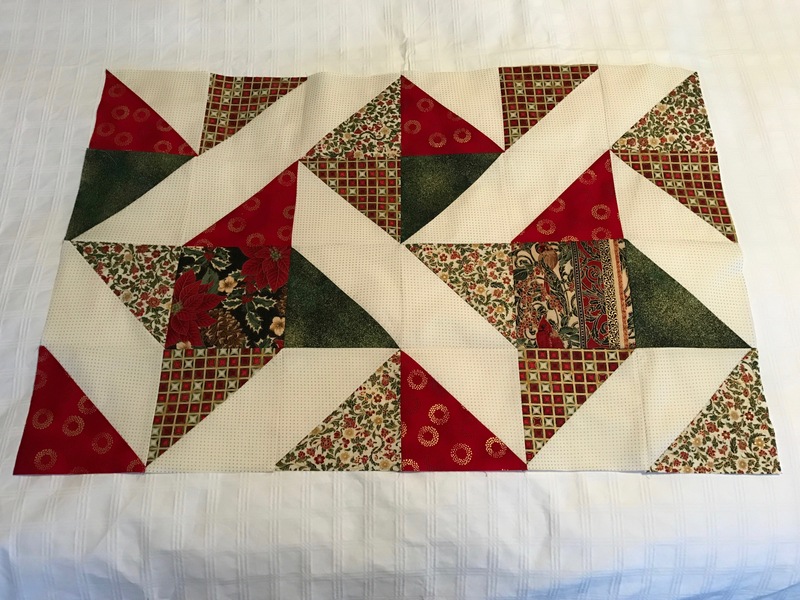 I assembled the squares into a central row then filled in the sides with another row of the small squares and edged with a set of light coloured triangles to set off my pieced strip against the dark backing fabric. I decided to construct the insert panel along the diagonal so incorporating the triangles would be straight forward. Nice idea. However, in spite of the fact that I trimmed the triangles, the further I got into the panel, the more it bent away from the straight! I took tucks in strategic seams only to find my next diagonal row was even further off. With the panel half assembled, I gave up. I gathered up the unused small squares and triangles, looked at them for a while, paired the small squares, then joined two pairs to create five inch squares – I ended up with nine which I aligned on point down the middle of my cutting table (in the end I needed only eight). 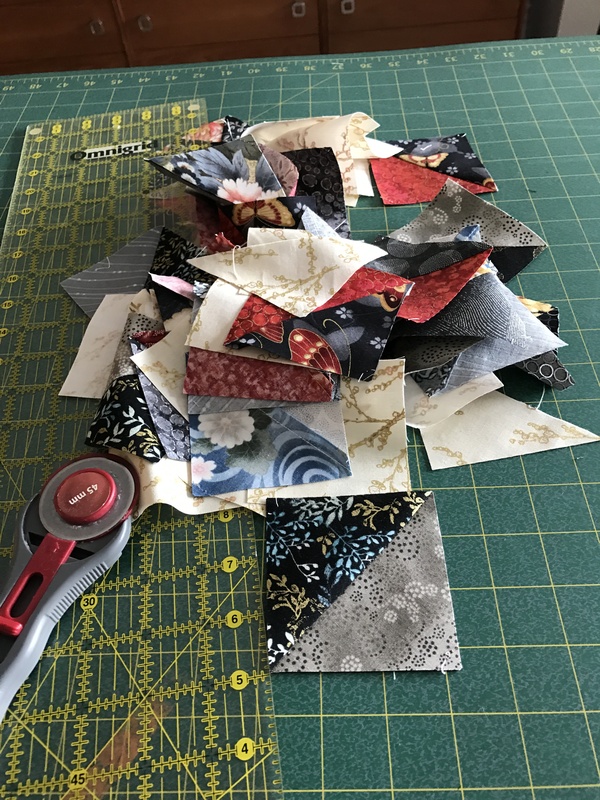 I had lots of the Kona solid “pepper” fabric I’d used on the quilt top – I cut 6 1/2″ squares (which I cut along the diagonal) and inserted the triangles in the spaces between the pieced squares. Finally I added two narrow strips of one of the black/white fabrics to offset the panel against the backing fabric. So my efforts weren’t entirely in vain. I have tucked away my failed attempt. I inserted my new panel into the backing fabric (offset twelve inches from one side along the length). I pin basted the quilt sandwich and you can see I’ve begun quilting the quilt. My finished quilt will end up 49″ x 62″. My quilt design (in a 360 X 200 hoop) has worked out to 7″ x 13.7″. 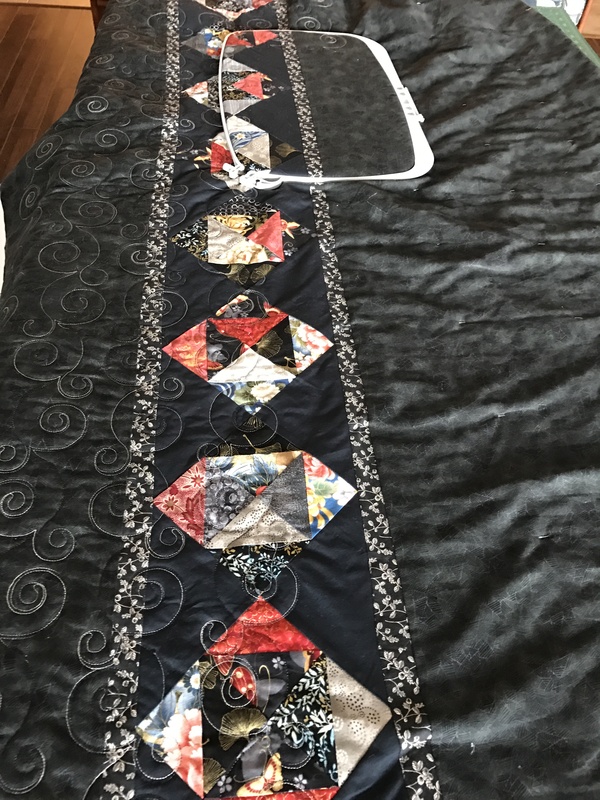 I’m quilting along the length of the strips rather than from side to side (to complement the strips rather than stitching across them) – I will end up quilting seven rows, each row requires 4 complete and 1 half repeat to cover the quilt from edge to edge. So far, I’ve stitched two rows and started the third. It’ll take me another two days to finish the quilting. I plan on binding the quilt with some of the backing fabric I was able to find yesterday in the sister shop across the harbour from where I bought the original backing fabric. I’m already planning my next project – a spring raincoat using PUL fabric (Polyurethane Laminate used to make diaper covers among other things) in black with bright umbrellas which I came across a month or so ago. Now to find a pattern…. 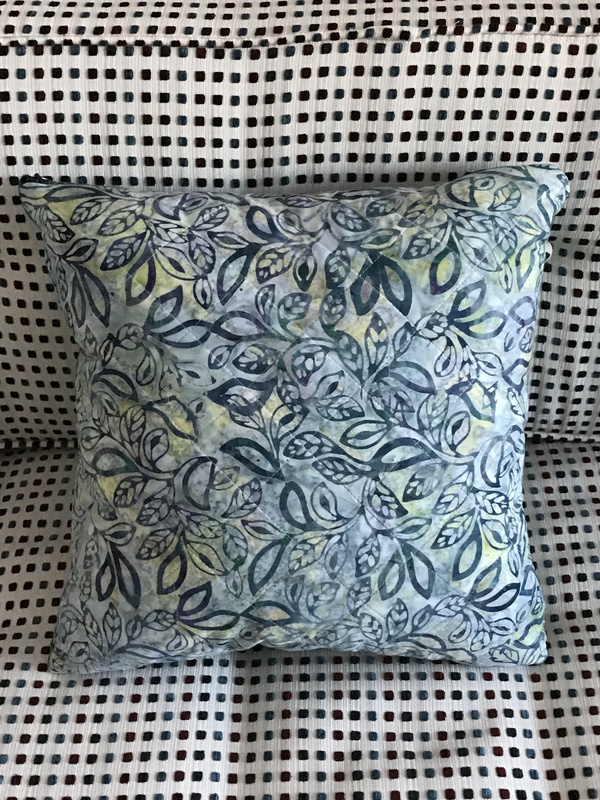 Here is the second pieced pillow cover as a demo for the gals interested in having a go at some sewing in ten days time. I had finished the 16 half-square-triangle blocks yesterday, I assembled them into a 4 x 4 array this afternoon. Added batting, stitched in the ditch around the “star” elements to quilt the cover top. Found a fabric for the back, cut batting – my original cut was 16″ – I needed 16 1/2″! so I had to cut a second piece of both batting and fabric. Quilted the cushion back along diagonal lines in both directions. This time I applied an invisible zipper (I’m actually thinking about taking the first pillow apart and inserting an invisible zipper into that one – I bought a second one for that purpose this afternoon). I’m about to sit down and write instructions for making a 16″ pillow cover from 10″ fabric blocks (layer cake size). 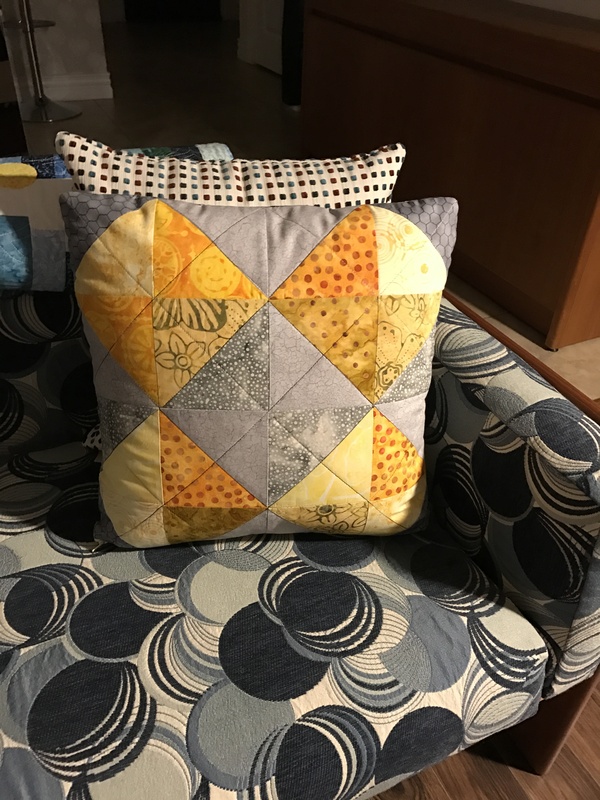 Step 3: Cut along diagonal lines, then again on both the center vertical and horizontal lines which yields eight 4 1/2″ half-square triangles – perfect for this size pillow cover. 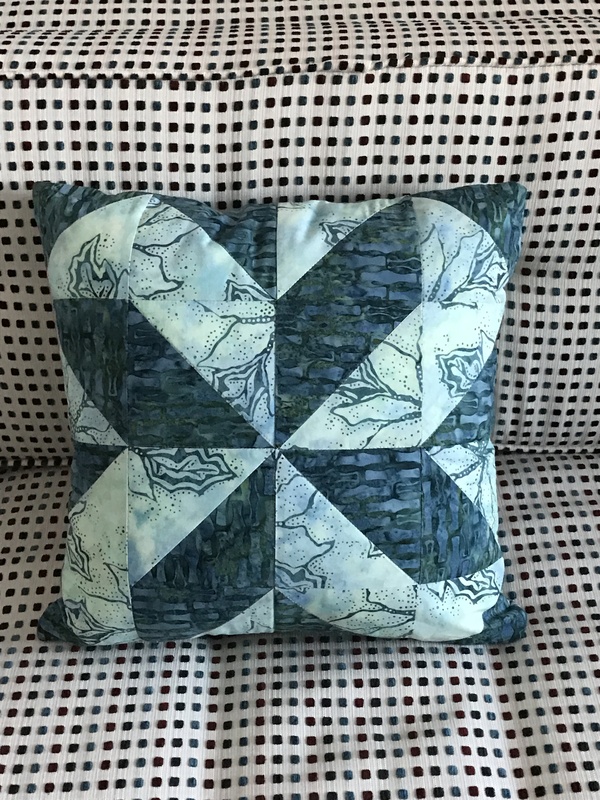 Here’s a tip for making a pillow cover – don’t sew the corners square. 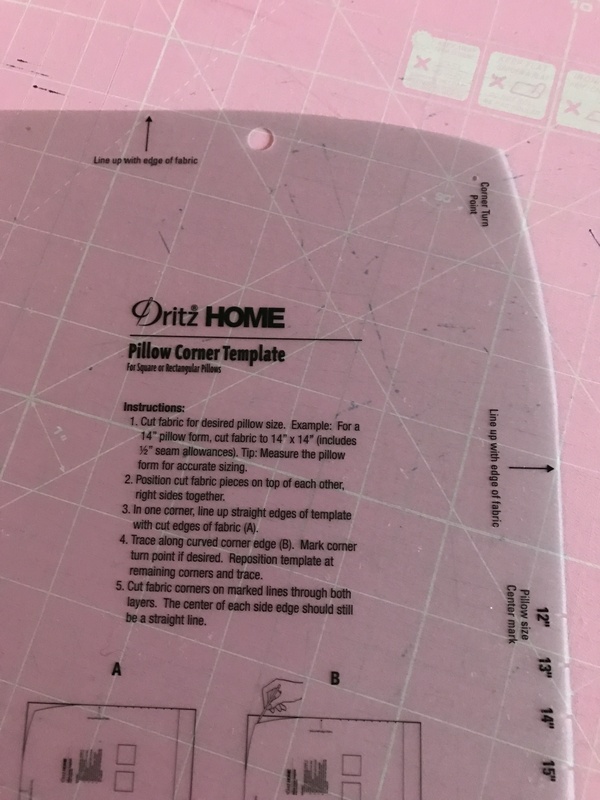 I happen to own this Dritz Pillow Cover Template (I’ve had it for years!). As you can see, it rounds off the corners removing about 1/4″ – 3/8″ from the corner. This rounded corner looks square when the cover is stuffed with a pillow. You don’t get those pointy “ears” on the corners. I trimmed my corners on both the yellow pillow cover yesterday and the one I just finished. I applied my zipper along the curved edge just fine, when finished the zipper edge looks square as do the other three sides. 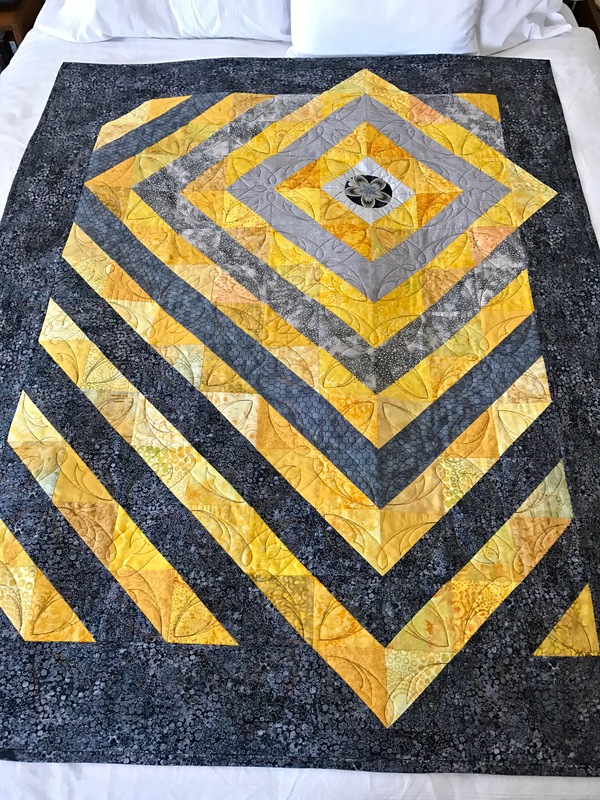 The grey-yellow quilt is finally quilted and bound. Before I left for Toronto, I’d assembled the quilt sandwich, pinned the layers, intending to get back to work on it as soon as I got home. Didn’t happen. We had a couple of severe snowstorms, I came home with a dreadful cold that triggered my asthma, so I spent the better part of 10 days doing little other than coughing. Finally, last Monday morning, I managed to go to the pool for my regular water aerobic class (I coughed quite a bit, but managed to breathe well enough to stay for the hour). Afterward, when I got home, I looked at the quilt and decided it was time to get back to work on it. I fused and appliquéd the circle detail in position, and quilted the immediate surrounding block but didn’t get much further till the end of the week when I managed to get the rest of the central blocks quilted. Sunday, I quilted the border. This morning, I added the binding and label. I still had a bunch of half-square triangles left over. I decided to use them for a pillow cover. Last week one of the other sewers in our Friday afternoon knitting/sewing group and I offered to assist those gals interested in making a pillow cover with piecing some half-square triangles into a 4 x 4 block. Five indicated some interest so Debbie and I are planning a sewing Friday in my sewing studio to make zippered, pieced pillow covers. 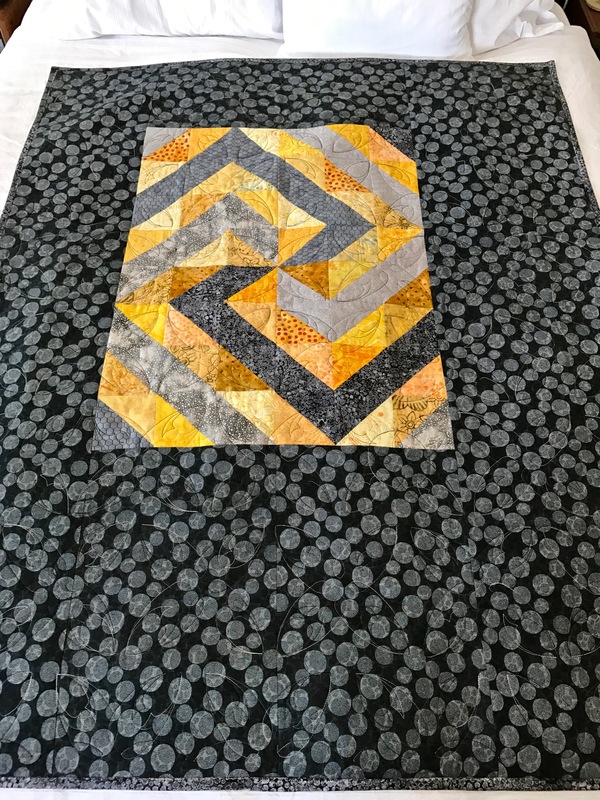 I started by gathering together all my leftover blocks – I had 13 constructed which I laid out in a 4 x 4 array – I made another four blocks being careful to use the appropriate grey fabrics so I could build some symmetry into my layout. I used my darkest grey in the corners, distributed the other two shades evenly, then sewed the blocks together. I added batting, and quilted along the diagonals to build some stability into the top. Next I cut a 16″ square piece of batik which I also backed with batting and stitched on the diagonal. 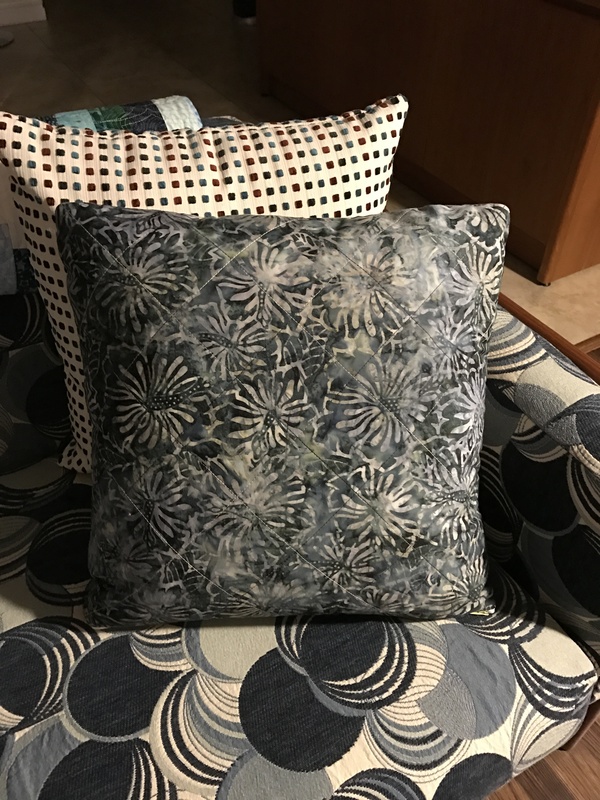 I trimmed the corners of both the top and back, slightly rounding them off, to create the illusion of ‘”squareness” when a 16″ pillow would be stuffed inside the cover. Finally, I added a zipper (a regular zipper, not an invisible one) to one end, unzipping it before sewing the two sides and the opposite bottom end. Our instructions to the women were to purchase just two contrasting fabric from which to construct their pillow top. Here, I’ve used several yellows and three different greys. So, I decided, my next pillow cover had to be constructed from just two fabrics. I dug through my stash and came up with a somewhat dark blue/turquoise batik but I had nothing light to complement it, so back to the fabric store to buy 1/4 m. of a light batik. 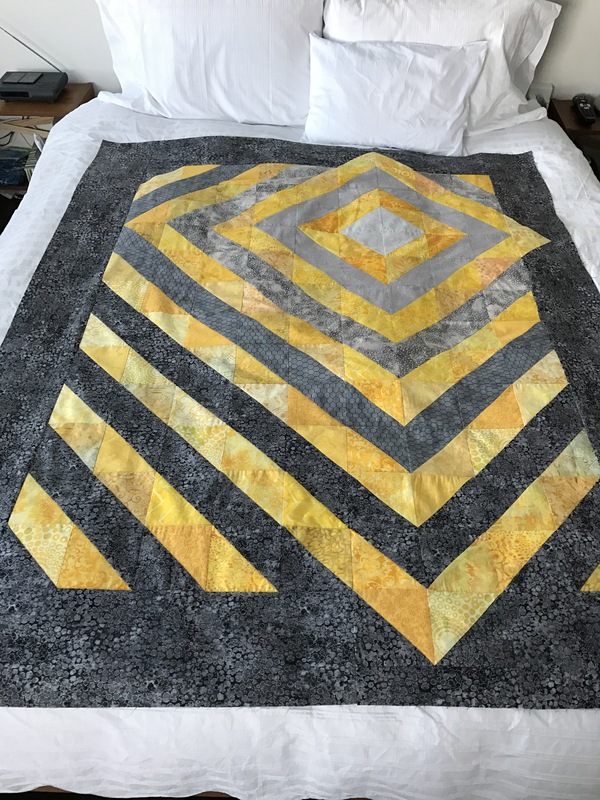 I cut each of my two 10″ width-of-fabric pieces into four 10″ squares – paired light and dark blocks, marked the diagonals, placed right sides together and stitched 1/4″ on both sides of the diagonal lines. 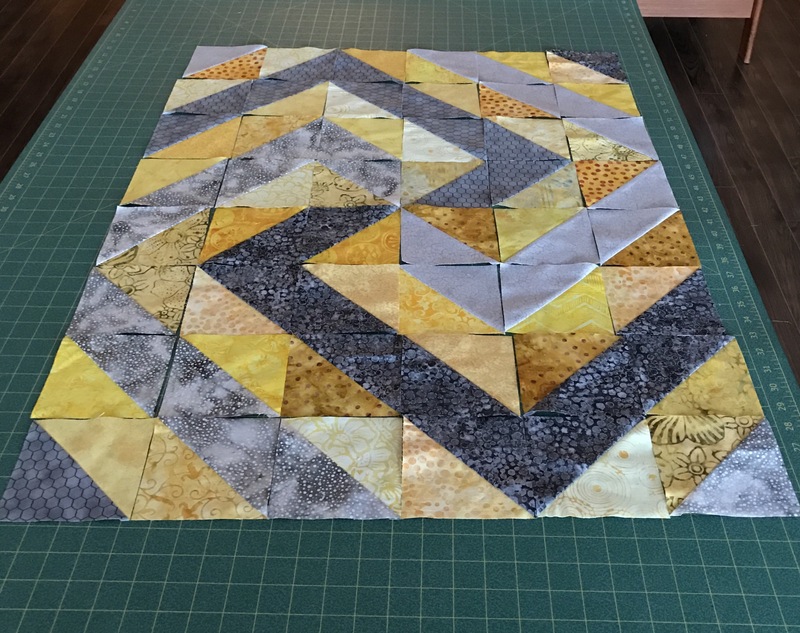 Then I cut along the diagonals and both the horizontal and vertical mid-lines to get eight 4 1/2″ half-square triangles from just two 10″ blocks! All I need for one pillow top is four 10″ blocks (two of each fabric). I’ve got those done and laid out ready to stitch, which I’ll do tomorrow. I have already cut fabric for the pillow cover back, and batting squares for both top and back. I still could use an 18″ invisible zipper (I like using zippers that are longer than I need so I can ignore the slide when sewing them in place, trimming them after I’ve completed the side seams). It’s not that I don’t have tons of #3 zipper tape (and slides) from which to make an appropriate length zipper, but if I use an invisible one, you’ll barely see it when I’m finished. Besides, both Debbie and I think the gals will be pleased with themselves for having actually sewn in an invisible zipper which is not difficult to do. So more tomorrow after I finish my second demonstration pillow. Just finished the top borders only to see in the photo that I’ve switched out two blocks and have then in the wrong place. So gotta carefully unstitch that area, and reposition those two blocks – not today. Maybe tomorrow. Other than that, I’m pleased with the finished top. The grey-black gradation has worked; the yellow doesn’t shift the way I was visualizing it but it’s still effective, more or less. I certainly can live with that. I’m pleased with the points integrated into the border – that worked out nicely. So now to come up with something for the back. 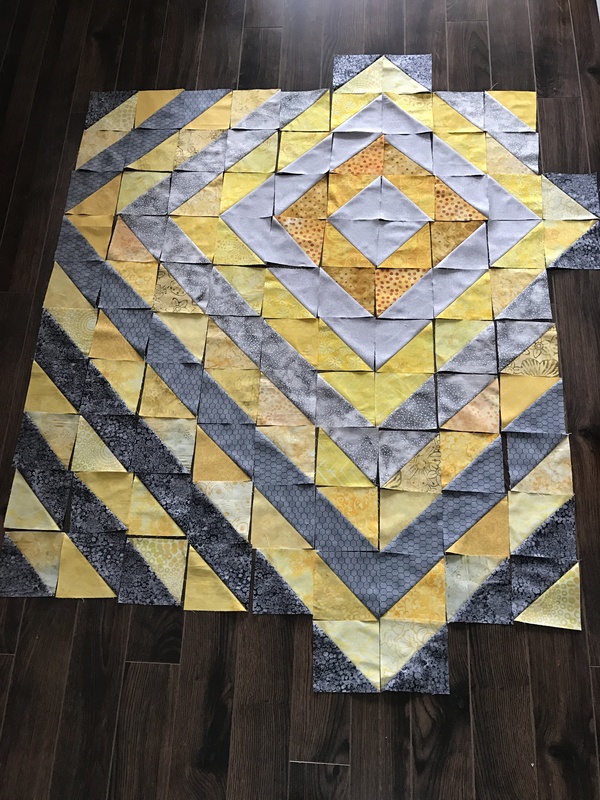 I have a lot of yellow/grey blocks left over – I’m going to have to play with them on the floor to see what I can come up with. 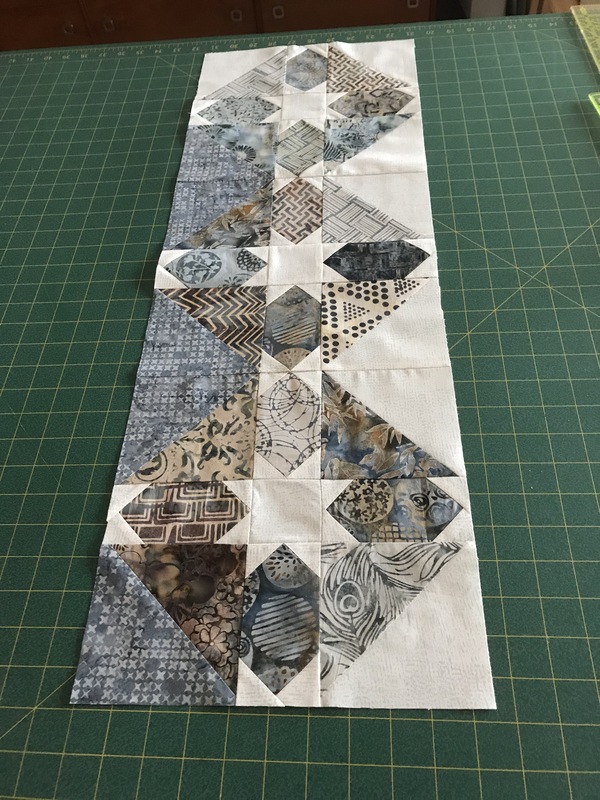 I’ll fill in around it with the backing fabric – this large 8 x 6 block will get positioned offset toward one of the quadrants. Zippered bags finished, I’m back at work on a Christmas Table Topper for a friend. Her table is 34″ x 80″ extended – with my half-square triangles finished size = 5 3/4″ I’ll finish at 35″ x 80 1.2″ which will work on her table. So back to half-square triangles – in this instance I have four strong printed fabrics with a light background. I wanted to try a truncated “Starburst” but the layout looked like nothing with my finished dimensions so I’ve opted for “flowers” with two different square print centres which will alternate from section to section. The square print fabrics are tying the coloured triangles together and providing some continuity to the design. 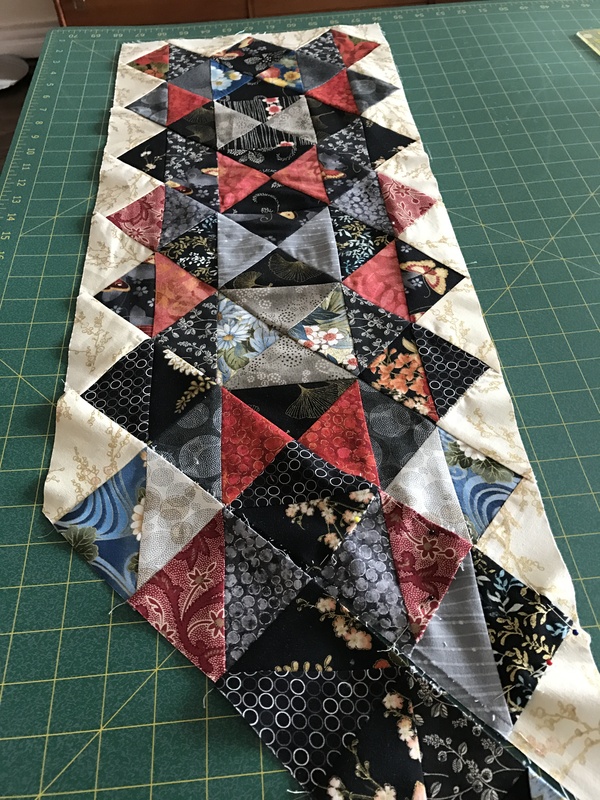 This is one end of the topper – there are two more sections of three rows each and a final end section of four rows for a total of 14 rows. I have backing fabric which I’m not going to bother to piece and I’m not planning on using batting but plan, instead, to use a panel of muslin to give the topper a bit of heft but no puffiness – balancing wine glasses on a quilt topper can be problematic. The muslin should provide just a small bit of substance to the topper. I plan on stitching all three layers using “stitch in the ditch” – but you never know, I might do something more complex once I get the topper assembled. I’m also planning to use a pillow case assembly for the back – no binding, the back is placed on the top, right sides together; you sew around the outside (1/4″ – 1/2″ seam allowance) leaving an opening on one side so you can turn the whole thing inside out like a pillow case, press, hand stitch the opening closed, then quilt – the fastest way of completing a quilt. No time tomorrow to work on this but I will likely be able to get the top pieced on Thursday. Finishing the topper will take no time at all. I’m not in a rush – don’t need to give it away until Christmas Eve. Then a table runner using the same fabrics but NOT half-square triangles! I want something with more density for the runner. So the Christmas sewing, which I never intended doing, is moving right along.